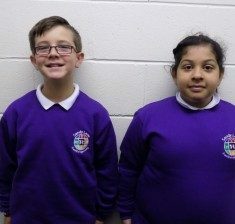 Sandy Lane Primary School’s uniform comprises of a plain navy or black skirt or trousers, a plain white or navy polo shirt and jade sweatshirt or cardigan; children in Year 6 wear a purple sweatshirt. 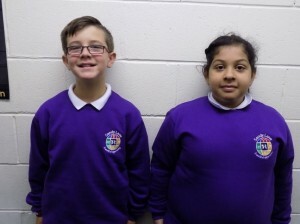 The school uniform can be purchased from Henry Smith’s in Shipley. In summer girls can wear either jade or navy gingham checked dresses which can be purchased from any major High Street store. Plain navy, grey or black tights or shalwar kameez bottoms or leggings can be worn under skirts. Plain black, navy or white headscarves may be worn. Sensible black school shoes with low heels must be worn. Trainers are not allowed except on PE days. 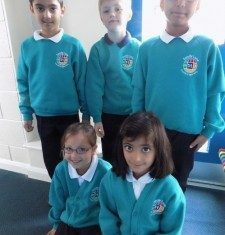 Many children like to come to school in boots or wellingtons during the winter months – but children must change into their normal school shoes or pumps whilst in school. Children are not allowed to wear jewellery except for small, plain, stud earrings and/or a watch. If jewellery is to be worn as part of religious practice, this should be discussed with the Class Teacher and a written form signed for health and safety reasons. Children must not wear hard headwear. No extreme haircuts or styles should be worn. This includes no excessive colour and/or lines or patterns cut into the hair. No make-up or nail polish should be worn. 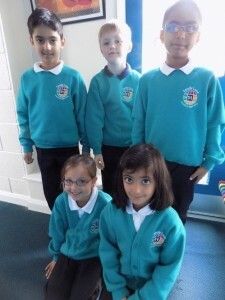 Hair accessories should be of a modest size and in school colours.